So here we are, Prom 75: The Last Night of the Proms (LNOP). The BBC Symphony Orchestra, along with the BBC Symphony Chorus, soloists Nigel Kennedy, Joyce DiDonato and Iestyn Davies, conducted by Marin Alsop, the first woman to conduct Last Night, all took to the stage in this marathon concert, with a running time of over three hours. It’s challenging enough to listen to via iPlayer, which you can pause whenever you please for food/toilet breaks, so it is an amazing feat for the Prommers to stay in such incredibily high spirits that whole time. The audience in the Royal Albert Hall were in high spirits from the very beginning and completely mad by the end. “It is not just an end-of-term party, it is also a wonderful celebration” and that it is, with LNOP featuring pieces from birthday boys Wagner, Verdi and Britten, violinist Nigel Kennedy, who also performed in Prom 34, and world and British premiere pieces. Be warned, there will be superlatives by the bucketful! LNOP began with the final world premiere for the season, Anna Clyne’s party piece Masquerade. It sounds quite like something out if a film soundtrack and makes full use of the big orchestra. A great piece to start LNOP, and one of my favourite world premieres this season. Bicentenary man Richard Wagner’s The Mastersingers of Nuremberg – overture. Overtures like this almost seem tailor made for Last Night, both musically, and in this case, titularly (though it’s more of a case of the Mastersingers of the BBCSC!). Excellent. The stage then was reset for Leonard Bernstein’s Chichester Psalms, which is a bit of a change of pace. Counter-tenor Iestyn Davies and the singers of the BBCSC were really beautiful in this piece. Ralph Vaughn-Williams’s The Lark Ascending, featuring Nigel Kennedy as the solo violin. I really like this piece, it’s so very English, and as it’s so calming and beautiful, quite an apt piece for the first half of LNOP, before the madness of Act II. Kennedy played beautifully, and listening to this piece on a Sunday afternoon, with the sun streaming in through my window, looking out on the green Australian countryside, everything felt rather perfect. Centenarian Benjamin Britten’s The Building of the House. This piece shows off the chorus wonderfully, and they do sound fantastic. 7. & 8. The final three pieces of Act I were all sung by soprano Joyce DiDonato, accompanied by the BBCSO. In order, they were Massenet’s Chérubin – ‘Je suis gris! je suis ivre!’, Handel’s Xerxes – ‘Frondi tenere e belle … Ombra mai fù’, and Rossini’s La donna del lago – ‘Tanti affetti in tal momento!’. These were very well sung, but I think I preferred everything else in the first act, rather than these three pieces, as I’ve said before and I’ll say again, I’m just not the biggest fan of opera. So far, over £82,000 have been collected for the Proms Musical Charities. The second half began with two pieces from Bernstein’s Candide, the Overture and ‘Make our Garden Grow’. I particularly loved the overture, it is quite a famous piece, but it’s a great one, too. The chorus were again sublime in ‘Make our Garden Grow’. I will keep going on about how great the BBCSC are, because they really are absolutely fantastic. The BBCSC again got to shine in the other bicentenary man Giuseppe Verdi’s ‘Va, pensiero’ (Chorus of the Hebrew Slaves) from Nabucco. This is probably one of the most famous opera choruses, and I must say, I operatic pieces sung by a chorus, rather than a soloist. Between pieces you can hear all the party-poppers going off in the crowd. This has been happening since the very beginning. Joyce DiDonato then returned to sing Over the Rainbow from The Wizard of Oz. This was a properly beautiful rendition of this song. Nigel Kennedy then returned to play Monti’s Csárdás. This is obviously one of those pieces that you miss quite a bit from when you can’t actually see it, as a number of times throughout this piece, the audience laughed. I don’t know why, as us poor iPlayer listeners aren’t treated to such information, but it was amazing playing by Kennedy anyway, who brings such energy and enthusiasm to his playing. I think in the end Kennedy was just improvising, as there were definitely the opening cords from Beethoven’s 5th Symphony and some other pieces thrown in there. That was brilliant. Next Joyce DiDonato took to the stage again, this time to sing the traditional Londonderry Air (Danny Boy). You can actually watch this here, and it was great to be able to see the RAH and what everyone looked like! It would be nice if the full stream was available internationally, but, alas, snippets are all we get. This song was beautifully performed. Very, very good. Singing voices at the ready, here we go! Joyce DiDonato sang “You’ll Never Walk Alone” from the Rogers and Hammerstein musical Carousel. I was also able to watch this here. I had the sound on my laptop turned up to full-blast, but it loses too much sound quality, so I ended up putting headphones in. At least then I can’t hear myself singing (though the rest of the family are probably thinking what is she doing?!). I love this song. I love 6000 people singing along to it. It’s brilliant. With hardly any break, the orchestra went straight into Granville Bantock’s Sea Reivers, which started a bit of an maritime-themed trilogy. This was a great piece, as I’ve mentioned before, I’ve really enjoyed all the Bantock pieces played during this Proms Season, and I hope to hear more of him, because all of his works have been wonderful. The maritime theme continued with the UK premiere of George Lloyd’s HMS Trinidad March. I love a good march, and this is clearly one of them. I found myself bopping away to it. Very cheerful, very good. Voices at the ready – the maritime theme concluded with Thomas Arne’s Rule, Britannia! You can watch this, Land of Hope and Glory and Jerusalem here. Words fail me. There is nothing I can say about this. Brilliant. Amazing. The best. An encore. Of course. Marin Alsop kept the Prom moving after the encore, plunging straight into Pomp and Circumstance March No 1 in D Major (Land of Hope and Glory). Again, what can I say. Watch it. Encore of the chorus. So much energy from the RAH audience. Parry (arr. Elgar) Jerusalem. Ibid. Full encore. Benjamin Britten’s arrangement of the British National Anthem (God Save the Queen). Even HM the Queen herself has said that she likes this version of it (which is saying something, since she’s rather well acquainted with said song!). It is a very good arrangement, and such a great way to conclude the Proms. And of course, the unprogrammed Auld Lang Syng, when the audience take over. This has probably been the best LNOP that I’ve heard. I’m at a loss for words. I can’t possibly listen to any more music for probably the rest of the night now. That was just so good and I wasn’t even there. There is nothing like the Proms, and nothing like Last Night. Prom 72 included two of this Proms Season’s theme: Verdi 200 and the Tchaikovsky symphony cycle. The Orchestra Sinfonica di Milano Giuseppe Verdi made their Proms debut with conductor Xian Zhang. Maltese tenor Joseph Calleja, who was heard on Last Night of the Proms last year, returned to the Royal Albert Hall to sing the arias. All of these Verdi pieces were, of course, very well played by the OSMGV, as one would expect when they take their name from the composer in question! As much as they were well played, and seemed to be wildly enjoyed by the Royal Albert Hall audience, they didn’t do a lot for me, mostly as I’m not a big opera fan. I do always enjoy the Aida – Triumphal March however. The second half of Prom 72 concluded this Proms Season’s cycle of the Tchaikovsky Symphonies, ending with his un-numbered Manfred Symphony, which Tchaikovsky wrote between his Symphonies Number 4 and 5. Considering what absolute symphonic gems the 4th and 5th symphonies are, the Manfred is a bit of a letdown. This work does divide conductor’s opinions – it seems to be a very love or hate work. I just feel a bit eh about it. It was good, but it’s far from being one of Tchaikovsky’s best works. The OSMGV performed a very energetic encore Rossini’s William Tell overture. Huge cheer from the audience at the end, very well deserved. Prom 71 is a rather big Prom, with not one, but two symphonies, performed by the BBC Symphony Orchestra with conductor Osmo Vänskä. 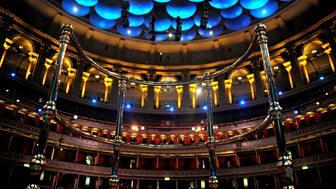 This is the BBCSO’s 10th of 11 Proms this season; their final Prom will of course be Last Night on Saturday night (UK time). The Proms Tchaikovsky symphony cycle also continues with Prom 71 featuring his final work, the beautiful Symphony No. 6. The Prom began with Henryk Górecki’s Symphony No. 3, ‘Symphony of Sorrowful Songs’, a rather mammoth work, with a running time of just under an hour. This piece is not called ‘Symphony of Sorrowful Songs’ for nothing – the entire symphony is particularly melancholy, and quite properly sad. Ruby Hughes n was the soprano, and I must say, she was outstanding. Despite this being a very sad piece of work, it is also beautiful, and was excellently performed by the BBCSO. Ralph Vaughn Williams’s Four Last Songs (orch. A. Payne) followed after interval, with mezzo-soprano Jennifer Johnston as soloist. This was nice, but after the excellent symphony beforehand, it didn’t quite hit the mark. The final piece of this Prom was Tchaikovsky’s Symphony No. 6 in B minor, ‘Pathétique’. This piece originally premiered in October 1893, with the composer as conductor, and then Tchaikovsky died only nine days later. This symphony is extremely popular in the classical repertoire, but it’s not my favourite of the Tchaikovsky symphonies; I much prefer 4, 5 and 1. But it is still a beautiful piece, and the BBCSO once again were fabulous. Only two more ‘normal’ Proms to go before Last Night! I hope everyone’s been practicing their singing! Prom 68 was a bit back-to-front in terms of concert arrangement – it started with a symphony for the first half, a concerto following interval, and then some symphonic dances. Well, it’s good to mix things up I suppose! 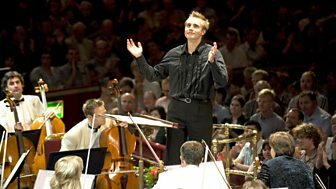 Prom 68 was performed by the Olso Philharmonic Orchestra conducted by Vasily Petrenko. The cycle of Tchaikovsky symphonies continues with his Symphony No. 1 in G minor ‘Winter Daydreams’ begins Prom 68. Tchaikovsky wrote this symphony almost as soon as he’d finished university, but it is not an obvious student piece. I love that even though this is the first symphony Tchaikovsky wrote, it’s still so obviously his work. Love the first movement. Around the 24:30 minute mark, that crescendo – wow. That was brilliant. And the ending is a proper big, all-in finale. This symphony is not played nearly enough in the regular classical repertoire, and it needs to be. It is amazing and every bit as good as the later Tchaikovsky symphonies. More ‘Winter Daydreams’ please! The Polish composer Karol Szymanowski’s Violin Concerto No. 1 with soloist Baiba Skride, making her Proms debut, was the first piece of the second act. This piece was nice and quite pretty, but after the fantastic Tchaikovsky symphony before interval, it felt a bit eh. The piece just doesn’t quite have the oomph of the Tchaikovsky. Finally, Sergei Rachmaninov’s Symphonic Dances concluded this Prom. Whereas the Tchaikovsky was the first piece he wrote out of school, Rachmaninov’s Symphonic Dances was the last thing he wrote. I quite like this piece and it was played wonderfully by the Oslo Philharmonic. The beautiful 100 ‘Welcome with Honour’ (English translation of a Norwegian piece) was played as an encore. And if you haven’t, check out Becky’s blog on her Proms experiences here – she’d actually attending the Proms in the Royal Albert Hall, unlike me, 10,000 miles away down here in Australia listening in on iPlayer! In Prom 67, it finally happened. I was so completely blown away by a piece that was new to me, I have gone and bought it on iTunes. I have been waiting to be blown away by a (new) piece (for me) for the past seven week thinking it might not happen, as last year it happened on First Night with Elgar’s Cockaigne Overture ‘In London Town’. It is Arvo Pärt’s Cantus in memoriam Benjamin Britten. Prom 67 featured the Orchestre de Paris conducted by Paavo Järvi. The Prom began with Avro Pärt’s Cantus in memoriam Benjamin Britten, that he (Pärt) composed after he heard of the death of Benjamin Britten on December 4, 1976. I am a huge fan of Arvo Pärt, and, while trying not to sound too biased, this was beyond beautiful. I especially liked the bell. It is, of course, quite a solemn and almost melancholy piece, but it is just so, so beautiful. I have not yet heard a piece this Proms season that is new to me that I have loved so much. 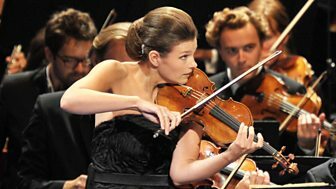 The haunting opening was followed by Britten’s Violin Concerto with soloist Janine Jansen. I especially liked the first movement and the second movement around the 29 minute mark on iPlayer. This is probably actually one of my favourite pieces by Britten, and possibly one of my favourite violin concertos (after the Tchaikovsky one of course!). The second act began with a piece that is practically the polar opposite of the Arvo Pärt that opened this Prom, Hector Berlioz’s overture from Le Corsaire. The pas de trios/pas de deux from the full ballet is one of best gala pieces in the ballet repertoire, and the score is fantastic. This was an excellent rendition of this overture by the Orchestre de Paris. It’s just such happy and joyous music. Camille Saint-Saën’s Symphony No. 3 in C minor, ‘Organ’, with Thierry Escaich on the organ. It isn’t until the final movement when the organ really comes into its own, but it is certainly worth the wait. This is a great symphony (especially that final movement), and a fantastic way to end what has been one of my favourite Proms of the 2013 Proms Season. The Promenaders have learnt that if they applaud and stamp for long enough, they will get an encore, and were duly rewarded with the gallop from The Ball by George Bizet. Thank-you to the Orchestre de Paris and Paavo Järvi – you were sublime. And of course, thanks to the BBC Radio 3 and iPlayer people! This a really brilliant Prom that I highly recommend listening to. Don’t miss the Avro Pärt, if nothing else. Prom 65: Film Music Prom begins the final week of the 2013 Proms season. The BBC Concert Orchestra was conducted by Keith Lockhart. 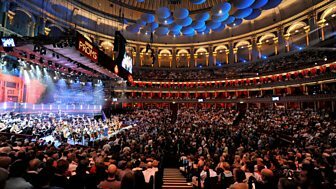 This was the BBCCO’s final performance at the Royal Albert Hall for this Proms season, but they will be performing across the road in Hyde Park for Proms in the Park on Last Night, this coming Saturday. Prom 65 kicked off with William Alwyn’s March from The True Glory, which was a most rousing way to begin. This was followed by discarded music from William Walton’s music from The Battle of Britain, which was very English and patriotic, and fitting for that specific film, of course, despite the fact it wasn’t used. Richard Rodney Bennett’s Lady Caroline Lamb Elegy for Viola and Orchestra suite followed. It was performed by soloist Laurence Power on the viola along with the BBCCO. This was a beautiful piece, especially around the 34 minute mark on iPlayer. Up next was the March from the 1958 war film Ice cold in Alex by Lucas. “Heave-ho!” The Warsaw Concerto by Addinsell from the film Dangerous Moon, performed by soloist Valentina Lisitsa concluded the first half. The second half began with experts from 2001: A Space Odyssey, beginning with Richard Strauss’s Also Sprach Zarathustra that we heard in full just last night in Prom 64. It also included the By the Beautiful Blue Danube waltz by Johann Strauss II, heard a couple of weeks ago in Prom 28. This was followed by the world premiere of the suite from Star Trek: Into Darkness. I really liked this film and its accompanying soundtrack, and, as this piece isn’t listed on the Proms website, I was pleasantly surprised to hear it, as, if you’ve seen the film you’ll know, its spot on. The BBCCO sounded absolutely fantastic playing this, and I loved it. For me, this was the highlight of this Prom. Following the Star Trek suite was the End Title from Independence Day David Arnold, which included a massive percussion section. This was very good. It would hardly be a film music Prom without some of John Williams’s score from Star Wars. There was a lot of Star Wars, about 20 minutes worth, starting with the Imperial March and ending with the Main Theme. To end, there was an encore of more John Williams, this time his theme from the original Superman films. Prom 64 featured the London Philharmonic Orchestra with their chief conductor Vladimir Jurowski. I saw fortunate enough to see the LPO with Jurowski in Melbourne a few years ago when they were touring out here, and they are a fantastic orchestra (they also record a lot of film scores, including, most famously, The Lord of the Rings Trilogy). The LPO did a wonderful job performing in this Prom, I just didn’t enjoy the program in this one as much as I have in others. It was ok, but I wasn’t blown away by anything. Granville Bantock’s tone-poem The Witch of Atlas kicked of Prom 64. It was very pretty, and very easy to listen to, but not my favourite piece of Bantock that we’ve heard this Proms season (Bantock has been the featured British composer this season, hence why a piece by him pops up every week or so, despite his works not featuring quite that often in the usual classical repertoire). This was followed by Sergei Prokofiev’s Piano Concerto No. 3 in C major, played by Proms debut soloist Anika Vavic. Very good ending to the first movement. There were some good, some obviously very challenging/quick parts with. Vavic played very well, and it was good, but I didn’t think that the orchestra featured very much after the first movement, and I’ve enjoyed other piano concertos more. The second act included two tone-poems, the first being Sibelius’s Pohjola’s Daughter. This piece was nice, but I didn’t feel that it was anything overly special. The final piece of Prom 64 was Richard Strauss’s Also sprach Zarathustra. The opening of this piece is very famous, most notably for being the opening of 2001: A Space Odyssey, as well as the theme music for NASA’s Apollo program. The LPO sounded terrific performing this, and it was definitely my favourite piece of Prom 64.